Hi guys, finally there was sun today! Holo time. 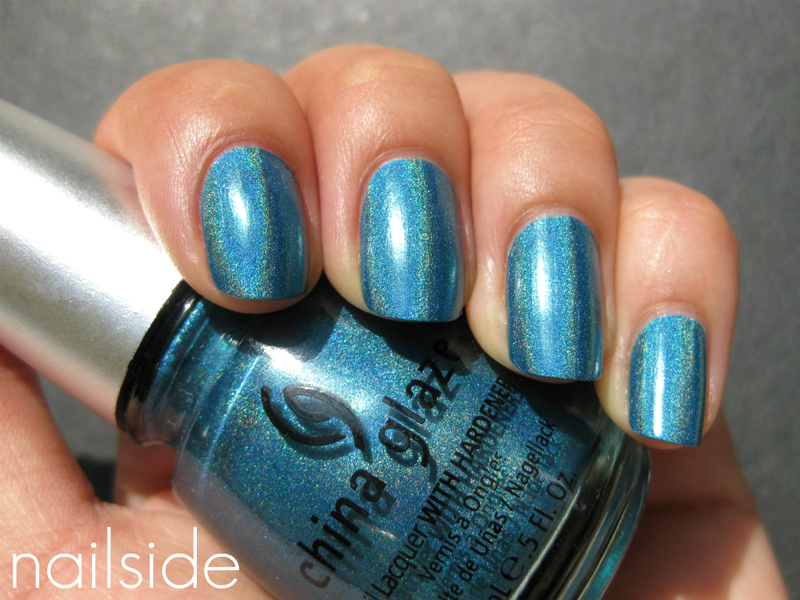 This is China Glaze DV8, a beautiful teal/blue holo. DV8 isn't as holo as Gosh Holo, for example, but still really pretty to look at. The application was very nice, I applied two coats for full coverage, and what was even better was the drying time! In several minutes it's completely dry, so it's also a great polish to use for tape manis ;-) Good night! What a lovely polish, great colour. You are one lucky lady. I've been drooling over this for what seems like years! This swatches aren't doing much to curb my craving!! So pretty :) I love it. Great purchase for sure! this looks so beautiful on you! love the color! I was just deciding between DV8 and IDK to wear.. It's a decision too hard to make! Anyways, your blog is really something! Man im a sucker for a pretty holo! I found this the other day at a dusty! How lucky!! That is a really nice holographic blue! I NEED!